The heart of any RAID system is its controller card. You can buy the highest capacity, fastest drives on the market and install them in the most sturdy, power-redundant, shock resistant enclosure you can buy. But if you controller card is merely a software-based "dumb" controller or if your "smart" controller with onboard processor does not deliver optimized performance, then you have less than optimal performance. Mediocre performance in a video raid can mean dropped frames. Worse than that, it could even mean loss of data in the event of disk failure. On this blog as well as in the pages of DV Magazine, I created what I called The Ultimate Raid based upon the HighPoint Technologies RocketRaid 3522 card, a ProAvio 8-drive MiniSAS enclosure and 8 Seagate 1TB drives. But I should have known better than to call it my Ultimate Raid. The minute I created the title, HighPoint Technologies went beyond ultimate with their release of the RocketRaid 4322. Priced at $699, the RocketRaid 4322 delivers all of the performance that the most demanding editor would ever require. Like its previously-ultimate sibling RocketRaid 3522, the 4322 is based around an on-board Intel processor. But the 4322 is based around Intel's IOP348 rather than the 3522's IOP341. This new speed demon clocks out at 1.2 ghz. As a result of this faster and more powerful chip, the 4322 boasts a cooling fan rather than the heatsink design of the 3522. Yet the fan runs so quietly that I cannot tell the difference between the two chips. The 4322 gains speed as well by now installing in an 8x PCIe slot in your Mac or PC workstation. It also supports both eSata as well as SAS drives thorugh its dual 4-lane MiniSAS connectors, just like the 3522. 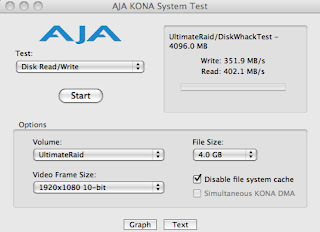 Likewise, the 4322 supports every imaginable RAID configuration-- JBOD, 0, 1, 3, 5, 6, 10, 50 an single drive. 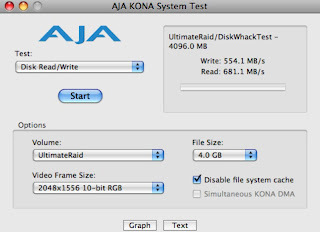 As I had written in the prior article, I recommend Raid 5 for video work. This level of protection which writes parity across all drives and can sustain the loss of one drive represents the optimal compromise between capacity and performance. The less-secure among us might want to configure Raid 6, reducing capacity and possibly speed to a degree but insuring against the loss of 2 drives. Let's take a look first at my earlier results from the RocketRaid 3522 in the above mentioned configuration using the AJA System Test utility, positing 1920x1080 10-bit uncompressed video. Not shabby results at all. No wonder I thought that nothing could ever top this and could call it Ultimate. That data rate could sustain and in fact did in real-world work 10-bit uncompressed full HD without dropping a frame or missing a beat. But look at the results from the 4322, this time assuming 2K video. Wow! My read/write speeds increased by 50%! I can edit Red footage! 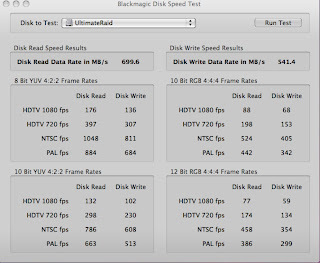 One more significant result comes from the Blackmagic Disk Speed test. Take a look at its read/write results as well as the maximum potential frame rate for a range of video scenarios. What a difference a chipset and bus-speed bump can produce. How do you say The Ultimate Raid Controller-- And Then Some? If you are rolling your own Raid, this is the card which can give you complete confidence in everything from DV through 2K and in the data protection which it affords. It earns my Ultimate recommendation. Video production software and hardware product tests and reviews for the video professional. Welcome To My Review Page! As a shooter, editor, tinkerer and writer I often find myself evaluating dozens of products at any given time. Many of my reviews make it to the pages of DV Magazine or Videography Magazine and my how-to articles can be found in HD Video Pro magazine or in the monthly subscription publication EditWell. But so many wonderful products only get mentioned within articles or on my posts on 2-pop.com, where I serve as one of the Administrators. So I decided to create a page which highlights products which otherwise would not receive a full in-print review as well as to highlight some of my work in progress which will eventually emerge as an article. 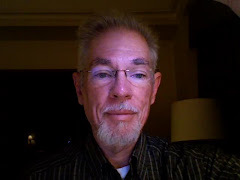 Feel free to email me with questions, comments, requests for personal consultation.